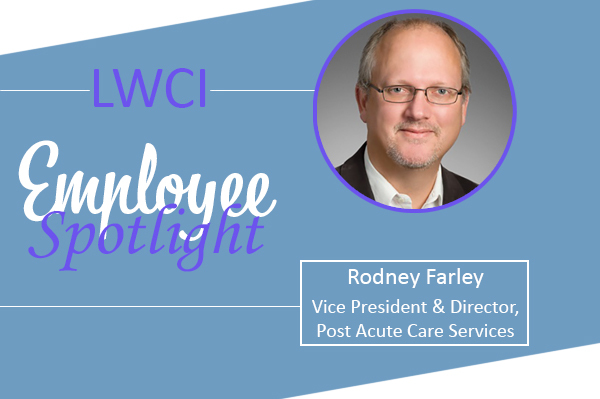 Rodney Farley, Vice President and Director of LW Consulting Inc.’s Post Acute Services division, will be celebrating 30 years with the company in May. I work with network, contacts, prospects and clients in bringing solutions to their needs and to bring value added services that will allow them to think outside of the box on the ever-changing operating, reimbursement and compliance landscape. Truly, living the LW Consulting, Inc. mission of "making lives better through worthwhile work." I enjoy working with incredible colleagues and their varied backgrounds and experiences that allows LW Consulting, Inc. to bring tremendous value to our clients. When I started, the firm was a CPA firm that had a healthcare consulting division. I did a college internship with the firm and was hired upon graduation. I started with working on financial audits and then got into audits of healthcare facilities. Over time, that morphed into providing reimbursement services for healthcare facilities and then into compliance and all aspects of consulting for healthcare organizations. I enjoyed and continue to enjoy the variety of clients and types of consulting services that we provide to clients. Starting out in this, or any other profession, requires someone to be a sponge—meaning you'll have to absorb a lot of information in a short time. At the end of the day, healthcare consultants are consulting on the business aspects of a healthcare organization. A background in business concepts like operations, management, accounting/finance and other areas is needed and can be developed when starting out with a company. Previous medical training or work experience is not always required. It is also important to have the desire to meet incredible people, in the industry, that care about the work they provide. In this profession, you will work with them to provide, not only solutions, but also to add value to the organization.